Klasse All in one and the Klasse Sealant Glaze have a reputation that speaks for itself. These state-of-the-art products will polish and protect the painted surfaces on your vehicle. Klasse Wax Products produce the depth and clarity of a high quality carnauba wax but lasts much longer. One or two applications of Klasse wax a year will keep your car protected and looking great! Acrylic is the Solution. Acrylic is different than wax, silicones, and polymers. This polish will bond to your car’s surface just like the previously mentioned treatments, but it will not cause any change to your paint, and you don’t have to worry about drying time. Klasse All In One dries as fast as you apply it, and there is no risk of hazing or streaking. All-In-One contains no abrasives or silicones, and does not stain plastic, vinyl or rubber trim. It can be used on any non-porous surface, and in addition to car care it is also approved for marine and aviation use. First introduced in 1979, Klasse All In One Polish changed everything about the way people polished cars. Klasse All In One Polish will remove oxidation, minor swirls, old wax, and other surface blemishes; leaving a beautiful and deep acrylic shine. Unlike some formulas, Klasse will not penetrate or change paint. 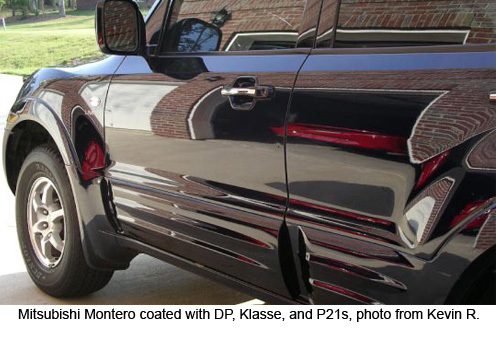 Klasse High Gloss Sealant Glaze is a highly concentrated acrylic formula glaze for new cars and oxidation-free surfaces. High Gloss Glaze provides an additional protective layer over the All-In-One with an exceptionally brilliant mirror-like shine. High Gloss Sealant Glaze creates an elastic, non-chip, shrink-proof, heat and scratch resistant - protective seal against ultraviolet rays, salt water, acid rain and industrial pollutants for up to 12 months. Use this glaze on all paints with or without clear coats, glass, fiberglass, Plexiglass, plastics, metal surfaces, enamel, tiles, Formica and all non-porous surfaces. It is anti-static, non-abrasive and contains no ingredients harmful to paint, metal or plastic. "Best price for Klasse wax. Shipped on time. Two thumbs up!" Klasse ALL-IN-ONE Polish 16.9 oz. Klasse ALL-IN-ONE Polish 33 oz. Klasse High Gloss Sealant Glaze 16.9 oz. Klasse High Gloss Sealant Glaze 33 oz.